Are you one of the homeowners who store their wine collection in cardboard boxes or shelves in their kitchen? Why not transform a seldom-used space in your home into a stylish wine storage area? Nowadays, almost any area can be converted into a dedicated wine cellar with the help of an expert. At Custom Wine Cellars Houston, we work with specialists in Texas and other areas in the US, who are creative and passionate about building wine rooms. One of our partners in custom wine cellar construction installed a stunning residential home wine cellar in a garage in Orange County. Experts do not recommend storing your growing collection in kitchen shelves or cardboard boxes. Since collecting wine is an expensive hobby, it is a smart idea to build a dedicated room where they can age well. Coastal Custom Wine Cellars, one of our top dealers in custom wine cellar construction, was hired by a homeowner in Orange County who wanted to convert his garage into a wine storage facility. 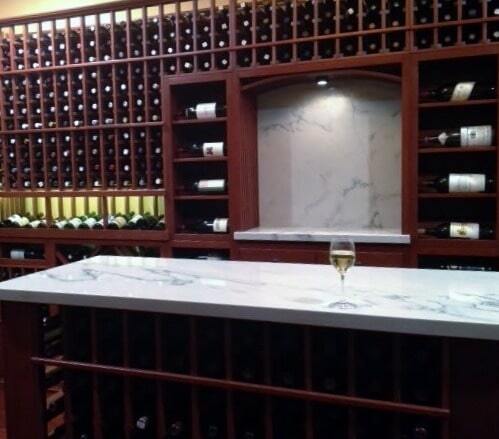 If you are living in the Texas area, Custom Wine Cellars Houston will find a master builder for your project. For this particular project, the client contacted Coastal Custom Wine Cellars in December 2013. He is a surgeon who loves to collect red wines from various regions in many parts of the world. He had hundreds of wines in his collection when one of his relatives, who happened to be a wine collector also, passed away. He was the one who inherited the collection. He decided that it was time to invest in a large wine cellar where he could store the wines safely. Aside from keeping wine at its best, a well-designed wine room adds value to the home. He had an unused 4-car garage, which he wanted to utilize for his wine room conversion project. Before the project commenced, we made a careful assessment of the client’s needs. We had to consider the location, size, and original structure of the room. We also had to ask the following questions to help us create a custom wine cellar that would meet his expectations. The answer to these questions had a significant impact on the visual appeal and technicalities of the wine cellar. How many bottles are you planning to collect? What is the ambiance that you want to achieve in your wine cellar? Do you want to utilize pre-built or custom racks? What is your purpose of building a wine room? Is it solely for wine storage and display, or are you going to use it for entertaining guests? What are the unique features that you want to incorporate into the design? Do you want the wine cooling unit to be visible in the cellar? Starting the Custom Wine Cellar Construction Process for Residential Homes in Houston, Texas: Free Complimentary 3D Design Package. Every client who works with us will receive a 3-dimensional package: plan views, rack elevations (labeled with letters A, B, C, D, and so on), room dimensions, rack measurement, bottle configurations, and bottle capacities. With CAD drawings, the client will have a better visualization of the completed wine cellar. If someone is living in the Houston area and is looking to have a similar project completed, then Custom Wine Cellars Houston can connect you with the right builder. When designed by a professional, a home wine cellar can be an exceptional addition to your property. 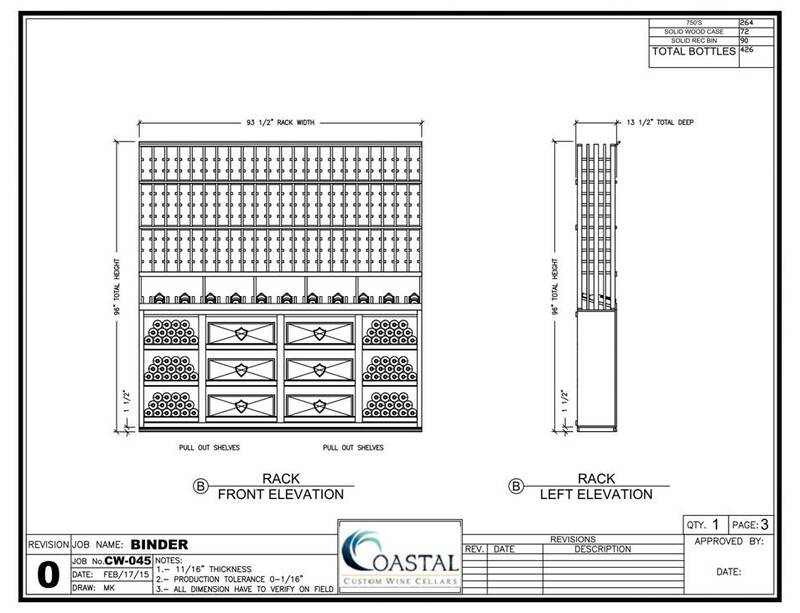 Coastal Custom Wine Cellars began planning the project in Spring. The owner wanted a wine storage room for 1,500 bottles. 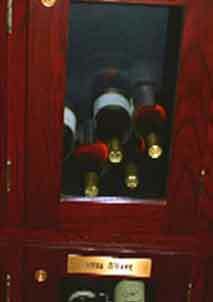 However, with the creativity of Coastal Custom Wine Cellars, they found a way to increase the bottle capacity. They have built a wine cellar in the garage that could accommodate 2,138 bottles. The room has a width of 17’ and a depth of 10’. They incorporated custom racking components to create a stylish and unique wine storage and display area. 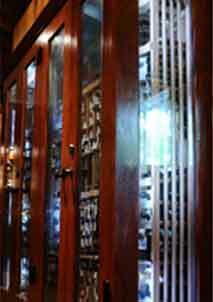 Pre-built wine racks are not recommended for wine collectors who want their wine room to stand out from the rest. 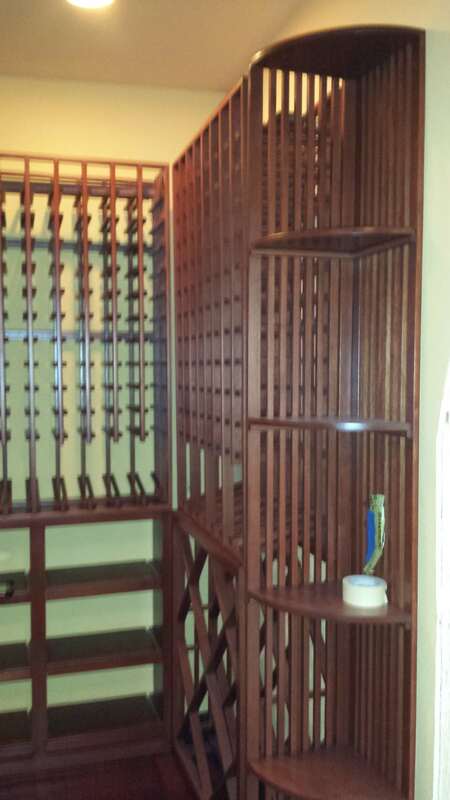 The wine racks were made from Mahogany, a type of wood famous for its beauty and durability. For a more luxurious look, they were applied with a satin finish and cherry stain. Coastal Custom Wine Cellars labeled the left wall Elevation B and the right wall Elevation D. They utilized the same bottle configuration on both walls except for the opening on the left wall. 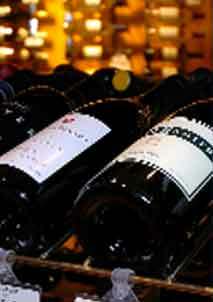 The top section cradles the bottles in individual wine racks. The middle section consists of high reveal display rows that store the bottles at an angle. Pitching the bottles will keep the cork in contact with the wine and prevent the cork from drying out. Drying out of the cork will result in brittleness and loss of elasticity, which can cause wine oxidation. Oxidized wines have an unpleasant taste and smell. To add character to the racking, Coastal Custom Wine Cellars installed rectangular bins and wooden case storage at the bottom section to allow for bulk storage and better wine organization. The wood cases were intended to house magnums and 1.5-liter bottles. For quick access to the cases, Coastal Custom Wine Cellars used roll out shelves. The back wall is located across the entry. There is a lattice arch with a tabletop at the top center of the wall with horizontal displays on both sides and a display row in the middle. 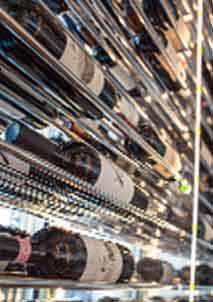 The rest of the racking at the top section consists of individual wine racks. Below the tabletop are two drawers and a double-door cabinet, which provide a storage space for wine glasses, napkins, bottle opener, and other wine cellar accessories. The bottom racking also includes single bottle storage, horizontal display, and diamond bins. The diamond bins store the bottles on top of each other. This racking style creates a good airflow around the bottles and allows for grouping the same type of wines in each bin. The racking on both sides of the door starts with a quarter round display rack, which provides space for more bottles and accouterments. 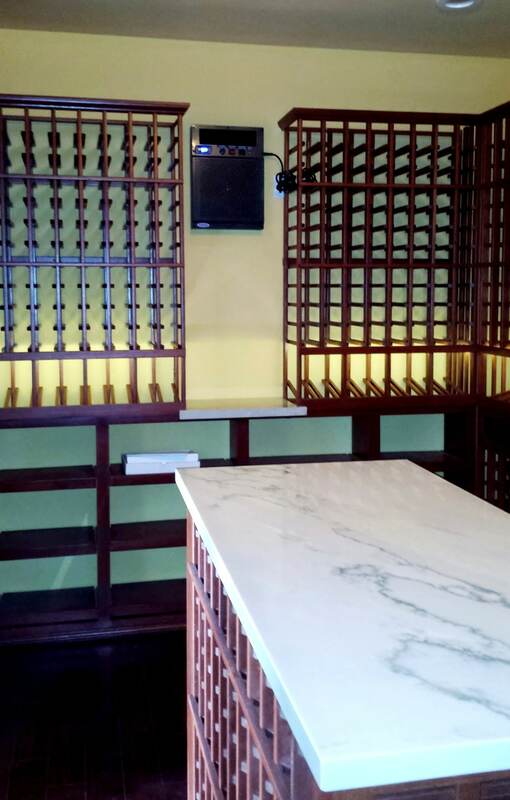 Diamond bins, individual wine racks, and a high-reveal display row were installed on these walls. The lighting system is another essential component in custom wine cellar constructions in Texas. In this particular residential home garage conversion project, Coastal Custom Wine Cellars used the LED lights, resulting in a dramatic wine display. Moreover, the LED lighting system is known for its low energy consumption and low heat emission. A reliable wine refrigeration system will prevent wine spoilage. Thus, working with a wine cooling expert will keep your wines safe. In this project, a CellarPro VSX wine cooling system was installed to achieve the optimum conditions needed by wine to age. The self-contained unit was place on the left wall of the wine cellar. The unit offers maximum efficiency and quiet operation. It has adjustable humidity control, advanced electronic thermostat, and an easy-to-remove and reusable aluminum filter. Custom Wine Cellars Houston is a member of the ‘Wine Cellar Designers Group’ an accredited third party of wine cellar builders and designers who hold the highest standard regarding wine cellar construction. 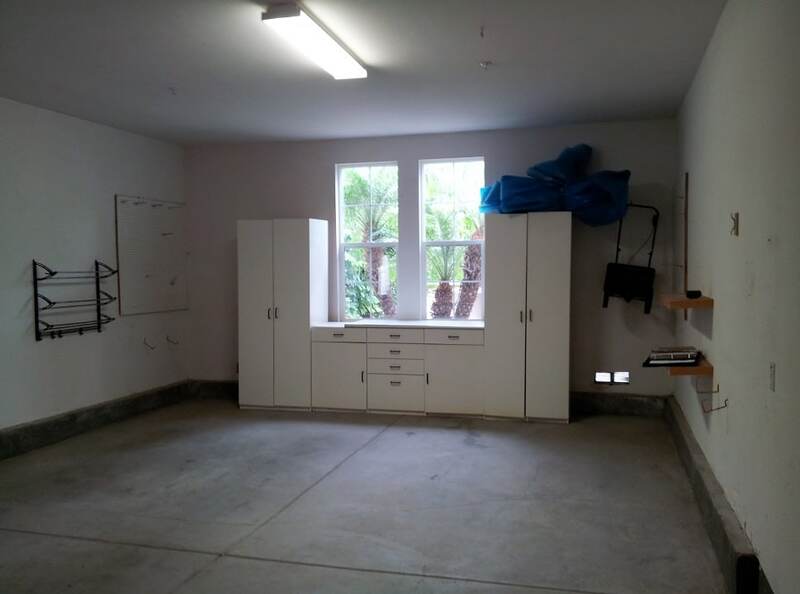 If you are looking for an expert for your residential garage conversion project in Texas, you can talk to one of our specialists at (281)-809-7283.